Place carrots and radishes onto large sheet pan, coat with olive, and season with salt and pepper. Roast in oven for 20 minutes until just tender. Set aside to cool to room temperature. Heat a grill pan over medium high heat or preheat outdoor grill. Place long beans, squash, and zucchini into a large bowl, toss with olive oil and season with salt and pepper. Grill long beans until just tender and grill marked, about 2 minutes per side. Grill squash and zucchini until just tender and grill marked, about 3 minutes per side. Remove to sheet pan and allow to cool to room temperature. Bring a medium pot of salted water to a boil. Slice broccoli into small bite-size pieces and blanche for 2 minutes. Using a slotted spoon remove from boiling water and shock in ice bath. Remove broccoli from ice bath and set aside. Slice raw kohlrabi into 1/2-inch thick slices then cut into pie shapes. Set aside. Slice pickled beets into quarters. 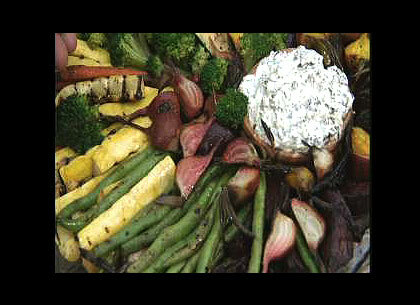 Serve all vegetables arranged on a platter with dip in a small bowl.